A property ownership cannot generally be transferred from one person to another. It involves a lot of paperwork. This is done by the government and is a legal process. However, the person making the transfer is required to place a request for the purpose. A Transfer Forms is used for this reason. In this form, the details of the owner along with the details of the new owner and important clauses should be included. 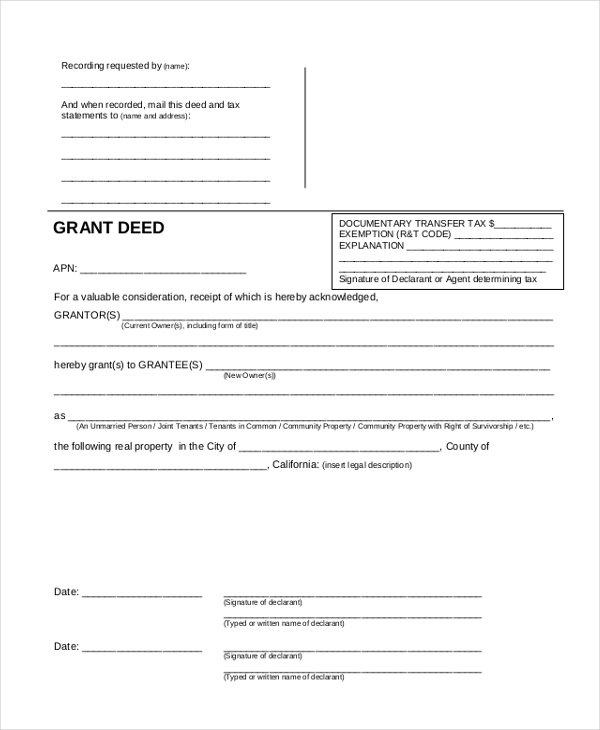 When a person intends to transfer his ownership of a property deed to another person, he is required to fill in this form with all the necessary details and submit it to the government agency. As the name indicates, this form comes in handy when a person wants to transfer the ownership of his property to another person. He should fill in the form with the details of the property as well as the two parties. 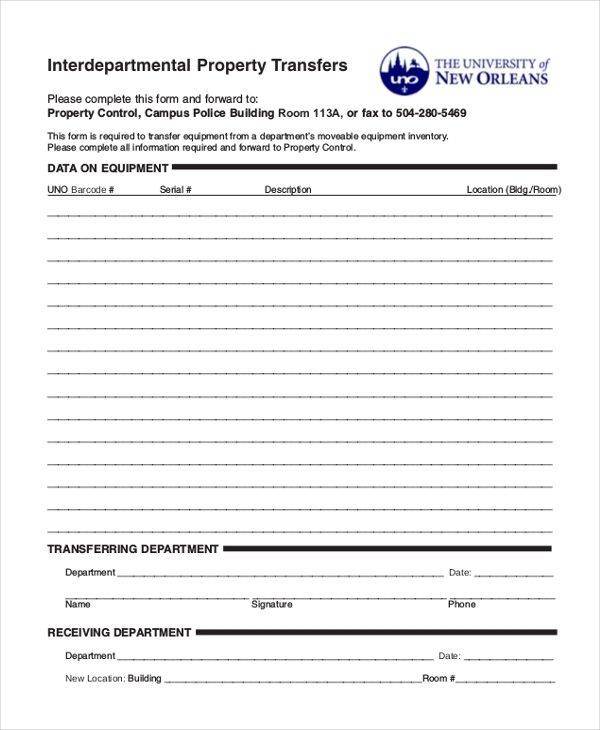 This form is used by the government to issue an affidavit to a person indicating that the ownership of a certain property has been transferred to him. This affidavit indicates that he is henceforth the legal owner of the property. When a person submits a request with the government to transfer the ownership of one of his properties to another person, the state studies the case and issues an order for transfer. It is for this purpose that the above-mentioned form is used. This form is used by the taxation department to allow a person to transfer the tax liabilities he has towards a property to the new owner. This is usually done when the person sells the property or transfers it to someone else. When a person wishes to transfer the ownership of the asset owned by him to another person, he can use this transfer request form to submit a request for the purpose with the government authority. This form is usually used in case of movable properties like vehicles, machinery, equipment etc. When a person transfers the ownership of the certain movable property to another person who intends to move it to a new location, this form is used to send a request to the government for the transfer of property. As the name suggests, this form is used by a business organization to enable the transfer of properties from one of its departments to another. This helps the authority to keep track of where the property is at a given juncture. What are The Benefits of Using a Property Transfer Form? 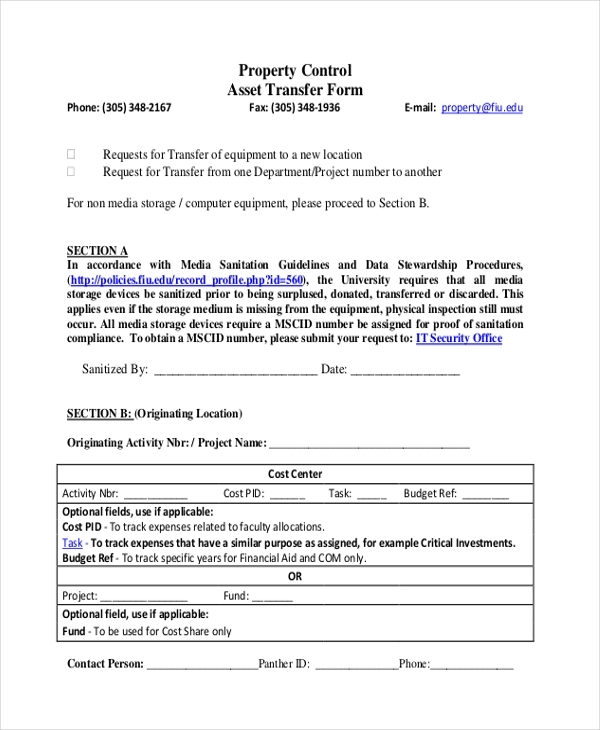 Why Should One Use Property Transfer Form? In a day, a government agency receives an assortment of requests. Thus, it may not be easy for it to identify the property transfer deals from the others. 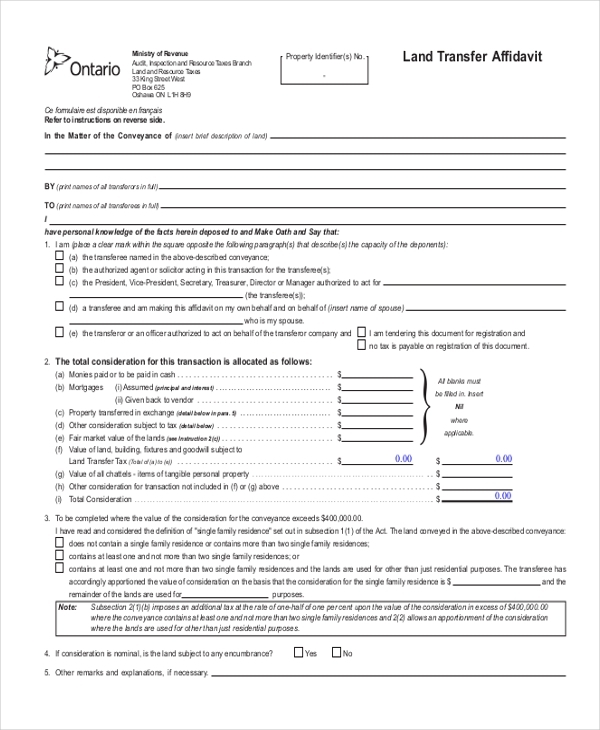 However, using this form ensures that the authority is well aware of what the document is about. Additionally, the form can be used to fill in all the information in a systematic manner which is definitely better than using a normal letter. 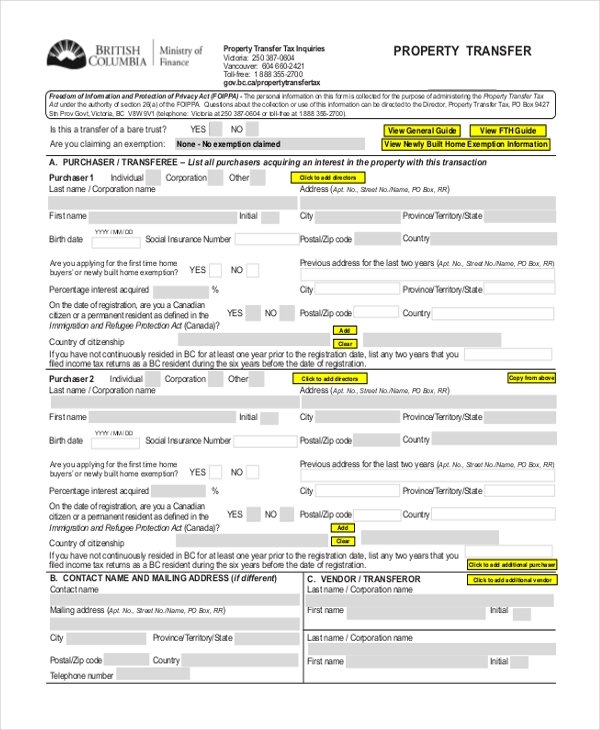 You may also see Vehicle Transfer Forms. 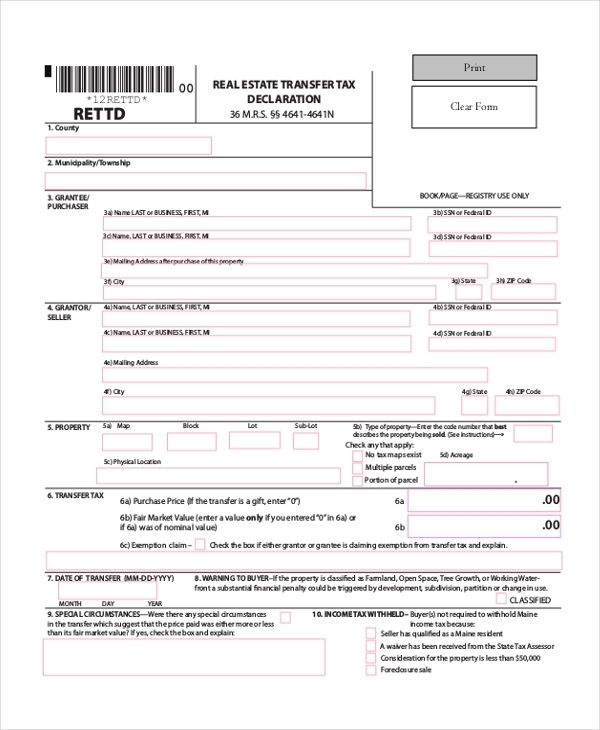 If you are thinking of designing a property transfer form without any expert help, get some idea by checking out the property transfer forms that we have to offer. You can use these by downloading them and then making changes to personalize them. 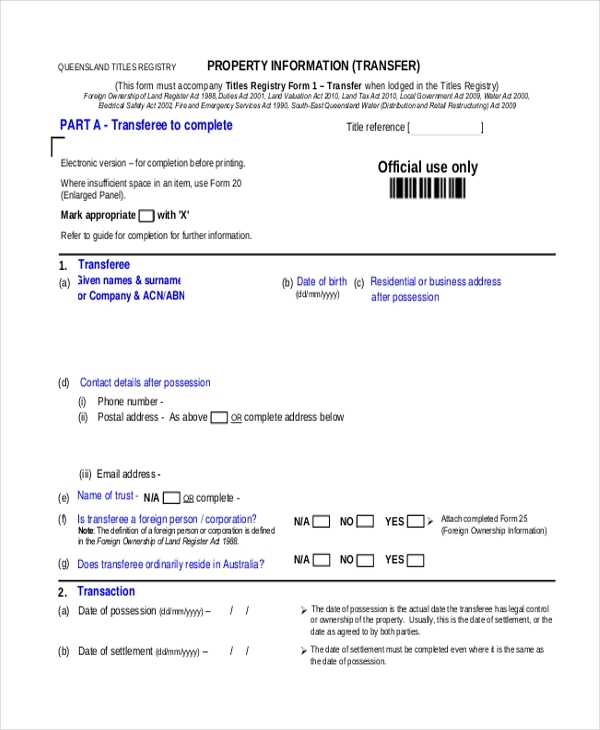 You can also see Stock Transfer Forms.